Even if we eat well and drink the cleanest water, we can not escape the toxins. Toxins are present in the air, in various processed foods, personal care products, and cosmetics. They are absorbed through the skin, inhaled and entered the body via the diet. Toxins are tiny molecules, proteins, and peptides that are capable of causing disease and various infections. They often lead to skin problems, indigestion, reproductive problems, inflammation, neurological disorders and multiple types of cancer. An overload of toxins also lowers the energy level, reduces physical and mental performance, causes mood swings and sleep disturbances. There are various ways to support the detoxification processes of the body. One such option is dry brushing. Why dry brushing supports the detoxification process Dry brushing, directly and indirectly, supports the detoxification process. Our skin is one of the most critical detoxification organs of the body. The dry brushing supports the detoxification process through the surface. It stimulates and opens the pores of the skin and dissolves dead cells and toxins that are deep in the skin. During rubbing, the skin is peeled and impurities removed. Dry brushing also stimulates the sweat glands, which remove toxins from the skin through sweat. The indirect impact is somewhat more complicated and is related to the body’s lymphatic system. The lymphatic system consists of lymphatic capillaries, vessels and lymphatic fluid, which are distributed throughout the body. An essential function of lymphatic fluid is to collect toxins and waste products in the body and transport them to the liver. The liver is the body’s primary detoxifying organ. It reduces toxins from the body and helps to cut them from the body. Since the lymphatic system relies entirely on muscle and skin stimulation to function and move the lymphatic fluid, it must be activated by special breathing techniques, gentle hopping, and skin stimulation. Without these stimulations, the lymphatic fluid moves only very slowly or not at all. Common consequences are then a feeling of sluggishness and laxity and toxin accumulations in the body. The lymphatic fluid moves through the lymph capillaries through the body. These are just below the skin surface. Dry brushing is an attractive way to stimulate these capillaries and promote the movement of lymphatic fluid. In this way, the lymph fluid can be transported to the liver and successfully eliminated from the body. The activity of the lymph nodes is also activated by dry brushing. The lymph nodes fight disease centers such as bacteria and foreign bodies. Peels the skin, opens the pores and helps to remove dead cells. This improves the texture of the skin. Stimulates the nervous system and helps reduce stress. The stimulating effect of the bristle acts as a kind of body massage. It helps to relieve muscle tension and calm the mind. The reason for this is the increased circulation of the skin and the expanded detoxification process. For dry brushing, a body brush with natural bristles (for example with vegetable bristles) should be chosen. A long handle is also very helpful to get to difficult to reach parts of the body. Synthetic brushes should be avoided. These can irritate the skin. First, brush your feet in a circular motion. Then touch the front, back and inner and outer sides of the lower legs and thighs in a circular motion. Then brush the legs with the dry brush ten times from bottom to top. Then brush the lower abdomen, abdomen, and chest with circular and then stroking movements. Then brush the arms, including the armpits and shoulders. It is essential to brush upwards towards the heart to promote healthy lymphatic flow. During brushing, long strokes should be made. Floats, scrubbing or heavy rubbing, should be avoided. By vigorous rubbing, the lymphatic capillaries are pressed too hard, and the desired lymph flow is prevented. There are many lymph nodes in the groin and armpits. These can be activated with circular movements. Ten times circular motions can be performed per side. During brushing, the skin can get a healthy light pink color. Heavy rubbing so that the skin turns red should be avoided. Dry brushing should be done for 10 to 20 minutes to stimulate detoxification processes effectively. 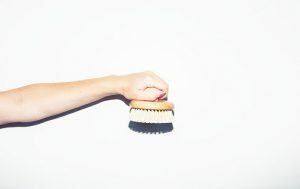 A) Dry brushing should be done in the bathroom as brushing removes many dead skin cells and impurities from the skin. It is easier to remove these from tiles. 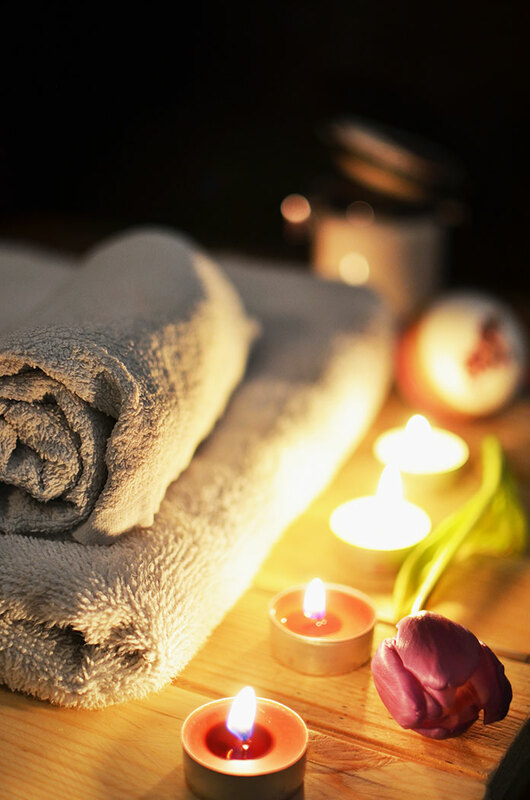 B) After the dry brushing, a warm bath can be taken for 20 minutes. Especially a bath with Epsom salt or Bentonite earth additionally stimulates the detoxification process. Since the pores are open after dry brushing, the natural bath additives can cleanse the skin in depth. C) After the bath can take a cool shower, the cold closes the pores and stores the moisture. D) After showering, cream the body with a natural moisturizer, such as cocoa butter or cold-pressed coconut oil, to rehydrate and nourish the skin after dry brushing. Repeat dry brushing 3 to 5 times a week. E) Dry brushing should not be done directly after sunbathing. By sunbathing the skin is irritated, more sensitive and prone to irritation and injury. F) Always use a dry brush with solid bristles and good quality. A dry brush with very soft bristles will only strip off the dead skin cells. G) The dry brush should not be used for bathing. H) This should stay dry. I) The dry brush should be replaced every month to ensure that a brush with strong bristles is used. This also minimizes the risk of infection from the old hairs. J) The dry brushing in the morning provides more alertness and energy. Dry brushing has a positive impact on the body. It affects the physical and mental well-being. To further aid detoxification, it is helpful to move throughout the day and drink enough water. Also, the consumption of green vegetables and leafy vegetables is beneficial and supports the detoxification process. The Amazon Bestseller Slimmer Healthier Beautiful is intensely focused on how women, in particular, can lose weight and tone their bodies. It shows how a nutrient-rich diet helps boost your energy levels and get rid of cellulite. Pure science illustrates what the body needs to get rid of body fat and shape the muscles.